Dangerous Immigrants and Deportations? Not Trump’s America, but Greenpoint 100 Years Ago! The more things change the more they seem to stay the same. Today’s headlines feature stories about dangerous immigrants on our shores, threats to national security and the need for mass deportations, but these very same headlines appeared a hundred years ago in the New York Tribune and one of the dangerous foreigners meriting deportation was a teenage Greenpointer nicknamed “Tommy the Kid.” While some media outlets today might scare people with menaces from Central America or the Middle East, in 1919 the fear was that Russians would spread the Bolshevik Revolution to the banks of the East River. 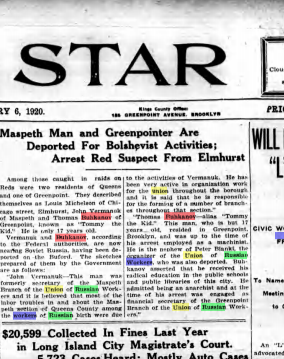 The December 23, 1919 edition of the New York Tribune ran an article on Russian anarchists who had been arrested by the government to be deported. The youngest threat to the American way of life was Greenpointer Tommy Buhkanov, who was just 17, but despite his youth was the Financial Secretary of the Greenpoint Branch of the subversive Union of Russian Workers, an association of Eastern European anarchists who supported worker seizure of factories and industries. “Wait,” you say, “Russians, but I thought Greenpoint was Polish?” Although Greenpoint was heavily Polish a hundred years ago there was a thriving Russian community here around Clay and Dupont Streets, which was centered around a Russian National Home at 106 Clay Street and a Russian Saturday school on Dupont Street and Manhattan Avenue that taught American-born kids how to read and write in Russian, but lets get back to the Union of Russian Workers and Tommy the kid. 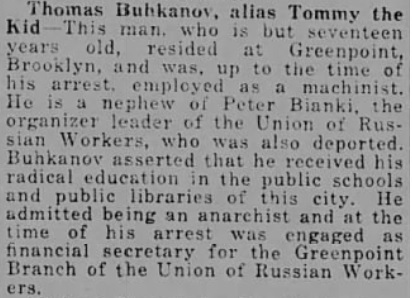 The report in the Tribune Tommy claimed that Buhkanov had learned his radical philosophy in New York City public schools and the public library, but its almost certain young Bukhanov’s radicalism came for his uncle Peter Bianki, the leader of the Union of Russian Workers New York branch based in Manhattan on 15th Street. The government feared the Union of Russian workers as part of the post-World War I ‘red scare.’ Anarchists who were defeated in the failed 1905 Russian revolution formed the Union in New York in 1910. 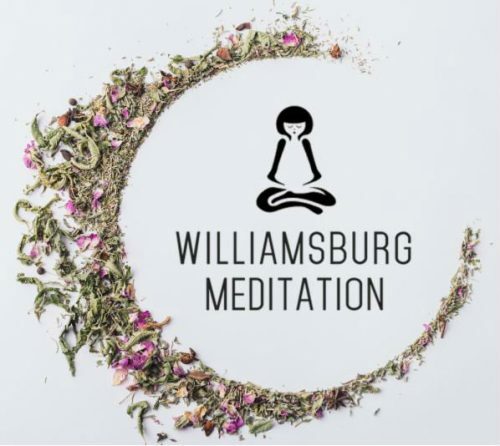 Estimated at only about 5,000 members, the group was for many merely a social organization, but it struck fear in the hearts of government officials because of its campaign of political assassinations. Earlier in the year anarchist Luigi Galleani blew himself up outside Attorney General A. Mitchell Palmer’s home in Washington in an unsuccessful assassination attempt on Palmer’s life. Later that year Palmer organized a series of raids that targeted Buhkanov, Bianki and other Russian immigrant radicals. Helping Palmer organize the raids was a young J. Edgar Hoover who would earn F.B.I fame. On March 12, 1919, police raided headquarters of the organization, just off Union Square. Club members were attacked and savagely beaten by blackjack wielding cops who broke multiple bones and even skulls. Blood was everywhere. Amongst those arrested in the raids along with Bukanov was Emma Goldman, the famous Russian born New York radical and her lover Alexander Berkman. All together police arrested 162 people on 15th Street as part of a larger operation spreading from coast to coast, netting hundreds of people. Eventually, many of those arrested in the raids were deported and placed on a special ship, the Buford, which sailed the radicals back to Finland. Bukhanov’s fate after his deportation is unknown, but his uncle joined the Communist Party of the Soviet Union and died in 1927 in Siberia. Considered a martyr, a town in Russia bears his name today. 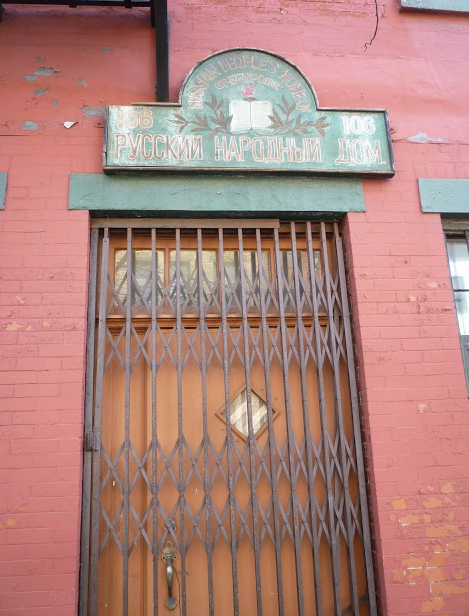 The Russian presence at the Northern tip of Greenpoint lasted by some accounts for another fifty years and the image below remained painted on Clay Street long after the last Russians had left. Although the Russians are long gone, sadly the xenophobia that prompted the Palmer raids lives on today.